Whether you are here for business or pleasure staySky Suites I-Drive Orlando is designed for you. Were perfectly located just off International Drive only minutes away from Orlandos theme parks and the Orange County Convention Center. Enjoy one bedroom suites with full kitchens and separate bedroom perfect for families. 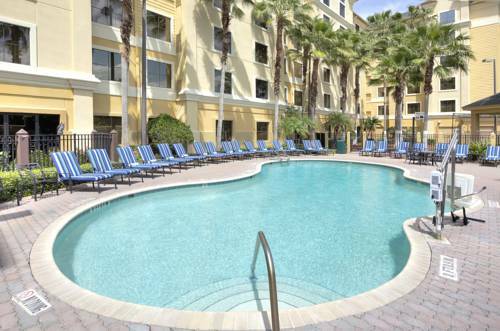 Our combination of quality value service and convenience makes for a perfect business or vacation stay in Orlando. Located minutes from universal Orlando resort and one block off world famous international drive. Reservations must be cancelled by 6pm- 72 hours 3 days prior to arrival date to avoid forfeiture of deposit. Except Advance Purchase. Exceptions may apply - please see rate rules. Whether youre coming to compete train or view a game at this mammoth attraction you will enjoy your experience. This state-of-the-art sports facility includes Champion Stadium - with professional caliber Baseball Quadroplex. SeaWorld Orlando offers the perfect blend of education and entertainment. This marine adventure park has 200 acres of shows rides and animal encounters. Your family will love the excitement of getting close enough to touch many of the wonders.